Enjoy Game viewing and Chimpanzee tracking. 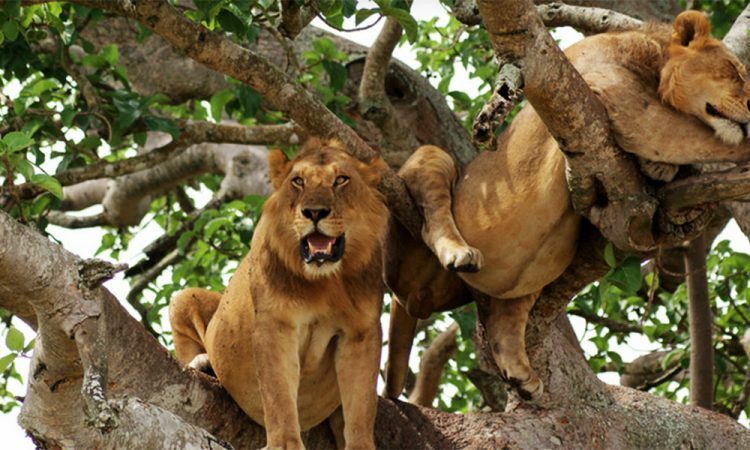 The four day Uganda tour itinerary takes you to Queen Elizabeth national park, the park accommodates various wildlife making it Uganda’s bio diverse haven. Some of the activities at the park include game drives and a boat cruise on the Kazinga channel. The second leg of the safari takes you to Kibale forest home to the chimpanzees and many bird species residing in the Bigodi wetlands. You will be picked up early in the morning by our guide before embarking on the journey to Queen Elizabeth national park. Upon reaching the park headquarters, you will check into the lodge for some relaxation and lunch. After lunch, you will be taken to the Kazinga Channel for a launch cruise. The 2 hour cruise has viewing the Hippos, Buffaloes and Elephants along the shoreline quenching their thirst from the burning sun and excellent bird viewing opportunities down the Channel as well as the highlights. Then return to relax, dine and overnight at the lodge. Checkout of the lodge very early in the morning and transfer to Kibale national park for chimpanzee tracking the drive from Queen Elizabeth to Kibale national park takes approximately 3 hours. And by 8am you will begin the exciting half day search for chimpanzees and other primates including L’hoests, Red-tailed colobus, Blues, and black and white colobus and grey cheeked mangabey swinging through the dense forest and Birds, butterflies and many small insects takes you towards noon hours. The guide will provide detailed explanations on not only primates, but also on all the forest’s fauna and flora, ensuring that your walk is both informative and enjoyable. This walk is excellent for viewing bird life and primates in close quarters. After the Chimpanzee tracking you will check in at the lodge for lunch. After lunch, you will be taken to Bigodi swamp for an entertaining nature walk where you interact with some members of the local community neighbouring Kibale National Park. You will then get back to the camp for dinner and overnight stay. You will end your Uganda safari by returning to Kampala form Kibale Forest National Park.